Chances are you will be celebrating dear old Dad this month. Whether that means your husband, your dad, or your son, Father�s Day is an important day to celebrate the men in your world. In my family that means a big party (in my family everything is a big party) with lots of kids, noise, fun, and food. Since Father�s Day is in June it is the perfect time for an ice cream cake. On a warm day this is a fun way to celebrate and enjoy something a little different. There are many different ways to build your ice cream cake. You can do a frozen cake roll, or a basic layered ice cream cake, or you can dress it up and decorate it in honor of Dad. Simple and splendid or elaborate and elegant � whatever your style, we have the recipe for success at your Father�s Day celebration! I will include some recipes for ice cream cakes at the end, but before we get there I wanted to cover a couple of basics. Of course your main ingredient will be ice cream, but the best part of making this at home is that you are free to choose any kind you like! You can really customize your ice cream cake to be your own little taste of Heaven! So, pick your favorite flavor and get ready to get creative. Once you have decided on a flavor you have some other choices to make. You can choose to layer your ice cream with a layer of cake, additional flavors of ice cream, cookies, candies, or all of the above. 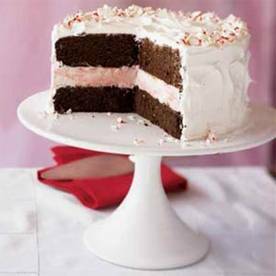 Some ice cream cakes are just a cake mix layered with ice cream on top while others include multiple ice cream flavors and cake or cookies in between. Again, the choices are completely up to you so find the flavors you love and have fun creating your ideal cake! After you have decided what you are using to build your masterpiece you will want to decorate it. 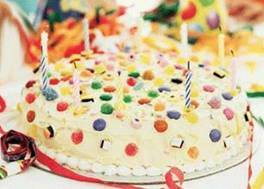 If you want to you can just leave it with the ice cream on top and maybe top it with a little whipped cream or colorful candy to dress it up or you can get just as fancy as you would like with decoration just as you would with any cake. You can do fun shapes, colors, designs, anything you want to add some fun to the design. Just use regular icing and make sure your ice cream is good and frozen before you try to spread it! For those of us that like some ideas to get started (myself included), here are some great recipes to get your mind � and stomach � working! And for even more information and inspirational ice cream cakes check out this great link to a dvo.com page with a tutorial video and some great ice cream cake recipe pictures! 1. Line a greased 15-in.x 10-in.x 1-in. baking pan with waxed paper; grease the paper and set aside. Sift together the flour, cocoa and salt; set aside. In a medium bowl, beat the egg whites on medium speed until soft peaks form. Gradually beat in sugar, 2 tablespoons at a time, on high until stiff glossy peaks form. 2. In another bowl, beat the egg yolks and lemon juice until thick and lemon-colored. Fold in egg whites. Fold in reserved dry ingredients just until blended. Spread batter evenly in prepared pan. Bake at 350 degrees F for 12-15 minutes or until cake springs back when lightly touched in center. 3. Cool for 5 minutes. Invert cake onto a kitchen towel dusted with confectioners' sugar. Gently peel off waxed paper. Roll up cake in the towel jelly-roll style, starting with a long side. Cool completely on a wire rack. 4. Unroll cake; spread ice cream to within 1/2 in. of edges. Roll up again. Cover and freeze for at least 3 hours before serving. 5. In a saucepan over medium heat, bring the sugar, cocoa and butter to a boil. Add water; return to a boil. Stir in milk; boil 3 minutes longer. Cool to room temperature. 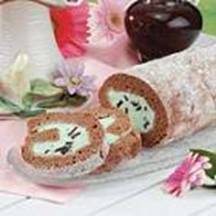 Serve over ice cream roll. Spray a 10-inch springform pan with cooking spray. Mix turtle brownie mix according to directions on box. Pour into prepared pan and bake at recommended temperature on box. Remove from oven 5 to 10 minutes before the recommended time on the box so that the brownie is still gooey. Let cool completely. Cut cake into 1/3-inch-thick slices. Halve each slice diagonally, forming triangles. Cover bottom of 9-inch-diameter springform pan with cake by arranging some triangles, points facing in, around edge of pan. Fill in center with more triangles; then cut additional pieces to fill in any spaces. Spread half of ice cream over cake. Freeze until firm, about 1 hour. Stir fudge sauce, chocolate chips and 1/4 cup water in heavy medium saucepan over medium-low heat until melted and smooth. Cool to just barely lukewarm. Spread half of fudge sauce over ice cream. Sprinkle with cookies. Top with enough remaining cake slices to cover. Spread remaining ice cream over. Freeze 1 hour. Stir remaining fudge sauce over medium-low heat until barely lukewarm. Pour sauce over ice cream, spreading to edge. Freeze at least 6 hours or overnight. Beat cream and sugar in medium bowl to peaks. Run knife around pan sides to loosen cake. Release pan sides. Spread whipped cream around sides (not top) of cake. (Can be made 1 day ahead. Freeze.) Arrange candies and candles atop. Have a Happy Father�s Day!